Some political analysts and commentators are of firm belief that this is the ideal and fully ripe time for the resolution of Kashmir dispute. After the Mumbai attacks Kashmir dispute has once again hogged the lime light and all the key global powers and players have felt the dire need of solving it as it is the key to the permanent and sustainable peace in south Asia. American president Obama all along his election campaign highlighted the need of resolving this vexed issue, and similarly British Foreign Secretary David Miliband made some rational comments which irritated India and recently U.N Secretary General Ban Ki Moon described it as world’s most dangerous place and Susan Rice described it as one of the hot spots. India may have got some relief from the Obama administrations move to appoint special envoy Richard Holbrooke with his mandate ‘limited’ to Afghanistan and Pakistan only, which many believe was done on Indian governments request as it would have created major hiccups for them as elections are just few months away in India. But it would be impossible for Holbrooke and Obama administration to overlook the lingering Kashmir dispute in their broader assignments in south Asia which has potential to disturb the whole equation of events and Americans know it that road to peace lies through the Kashmir and the basic cause of contention between India and Pakistan is Kashmir dispute and that is why despite Kashmir being not on Holbrooke’s “Plate” he said “ we have to understand that to get the Pakistanis to focus on the west, we have to have a reduction in tensions between India and Pakistan”. Back home pro-freedom leadership doesn’t look prepared to gear them selves to meet the changes and challenges which may come into effect after the loksabha elections in India will be over, they need to come out of illusion of defeat and set back after the good voter turn out in 2008 elections. If they analyze recent elections properly they haven’t suffered any defeat as the “mainstream” camp got forced to toe their line and they had to leave the pro-India cloak to seek the votes from people hence the stand of pro-freedom camp stands vindicated. And people didn’t voted for any ideology but only for developmental issues and de-linked Kashmir dispute from elections and forced the “mainstream” leaders to do the same. Pro-freedom leadership represents the sacred sentiment which is deep rooted in the hearts and minds of people of Kashmir, so there is no question of defeat or of any setback to them. Our intellectuals should come up with innovative ideas and present them before the pro-freedom leadership rather than criticizing them only and they should stop questioning the commitment of people towards the freedom struggle as people are wedded to the cause of complete independence and sovereignty of Kashmir. Yes criticism is necessary but only criticism won’t do anything, our intellectuals should put their heads together and present suggestions before the leadership and guide them to empower them with new ideas constantly so that they can carry on freedom struggle with renewed vigor and impetus. Recently many pro-freedom leaders admitted that due to lack of any strategy they failed to capitalize on the popular agitation witnessed in 2008 and lost an important opportunity. Now it is for intellectuals to come forward and help them in formulating a clear and workable strategy. Mere criticizing them would amount to hypocrisy. It is the responsibility of everyone to see and check whether the struggle for independence is going on in right direction or not, as we all belong to this soil, hence can’t escape the huge responsibility laid on our shoulders by the lakhs of martyrs who gave their red hot blood to highlight this dispute in international arena. In this regard intellectual class of our society has more responsibility and they should take the lead and discharge their moral and national duty accordingly and it would be better if they will do it collectively. India has always been in denial mode in accepting Kashmir as the core dispute this has impinged the peace, progress and security of entire south Asian region, this dispute has led to the arms race in this region due to which it has become a big drainage to the sources of India and Pakistan and of Kashmir as well hence its resolution is must and in the interest of all. So it is imperative for the pro-freedom leadership that they exert themselves like conscientious protagonists of the cause of independence of Kashmir and it is for our intellectuals to add more subjectivity to it which will prove a deterrent against the trends of war in South Asia and will act as buffer between India and Pakistan. Few days ago APDP (Association of Parents of Disappeared Persons) staged a sit in protest in the heart of Srinagar pressing for their demand of whereabouts of their relatives subjected to enforced custodial disappearance by the various security agencies, troops and police mostly since the break out of armed rebellion from 1988, and appealed the C.M Omar Abdullah of setting a truth and reconciliation commission of which he has remained a vocal supporter before and during his election campaign. According to APDP more than 10000 people have been subjected to custodial disappearance and C.M being Chairman of Unified Command Council has moral duty to look in to their genuine and humane demands. Subjecting people to custodial disappearance is worst kind of human rights violation and it has been mostly seen the relatives of disappeared persons suffer from the mental trauma and remain in dilemma about the safety of their near and dear ones which is horrific to say the least. After the shocking discovery of hundreds of unmarked graves in different parts of Jammu and Kashmir mostly from Uri many including the relatives of disappeared fear about their loved ones who have gone missing under the custody of troops. Even a stone hearted will get softened as their demand is nothing but to show them the graves of their dear ones if they have been killed or let them a chance to meet them if they are alive. In many cases where the perpetrators of human rights violation be that custodial disappearance, custodial killing, fake encounters or other violations have been identified they have got away from any kind of accountability by the draconian laws powered to them through which they enjoy total impunity from the law of land. 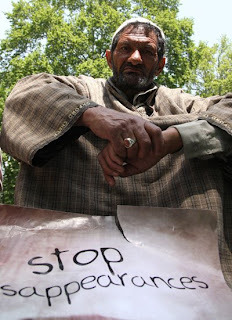 Indian prime ministers assurance on the soil of Kashmir about ‘Zero tolerance’ to human rights violation and assurance by any other leader will continue to remain as mere rhetoric as long as these draconian laws are not withdrawn. Recent statement of Mufti Sayed (former C.M) merits attention where in he also stressed on this fact that investigating these violations on case to case bases will be inadequate. Recently a news report in various media sections carried the statement of Jammu and Kashmir Tourism Alliance in which they demanded abrogation of Disturbed Area and Armed Forces Special Power Act as these laws are a hindrance to get foreign tourists to Kashmir, hence a major stumbling block to the tourism sector. In 2004, a Manipuri women Thang Jam Manorama was abused and killed by Assam Rifles and after the protests erupted to repeal the AFSPA then in November that year the then Prime Minister of India A.B.Vajpayee constituted a committee to review the provisions of the AFSPA and the said committee submitted report in which it was reported that “the act, for whatever reasons has become a symbol of oppression, an object of hate and an instrument of discrimination and high hand ness”. But unfortunately this report was made to appear like as north-east centric view and missed J & K where violations are much more and according to average mentions about J&K by the US state dept in its country state report on human rights violations and killings in conflict areas from 1993-2002 are 56.4 and combined seven states of north-east is 36.2 which is far less than J&K. It is the oppression unleashed by Indian troops backed by these black laws which have alienated the people of Kashmir more and more and in the words of South Asian Free Media Association (SAFMA) this alienation among the people of Kashmir is complete and irreversible. The brutal tactics employed by the India. forces here to suppress the movement for unfettered right of self determination have always backfired as this have provided the necessary ammunition to the freedom struggle to move forward with renewed vigor and this was witnessed by whole world during the agitation here few months back. Kashmir dispute will continue give sleepless nights to the Indian leaders and policy makers and this dispute if left unresolved will continue to remain as major threat to peace and progress of South Asia. Hence a multi pronged peace offence is needed to start tripartite talks for its final resolution. To make the atmosphere conducive for meaningful talks India has to initiate steps to remove the deep mistrust which she has created by its denial mode and time gaining policies, first and foremost these draconian laws should be repealed, troops should be moved back to barracks in a phased manner and a impartial commission should be made to look in the violation of human rights as demanded by ITHB and APDP and let them know where there near and dear ones are for which they have been protesting from a long time. Now leaders of Indian Muslims have decided to form a political party at national level though late but better than never. This is a welcome move by the Muslim leaders of India it should be appreciated as a positive and an assertive step taken by them. The announcement of forming a political party of Indian Muslims at national level came in a press conference by Maulana Baduruddin Ajmal, who heads the Assam United Democratic Front, earlier few days ago newly formed Ulema Council also decided to field two candidates for two seats of Azamgarh Sadar and Lal Ganj to espouse the cause of Indian Muslims at national level. While its need was felt among the 180 million Muslims living in India since a very long time but it should be a united well coordinated effort rather than striking individually and separately for this cause of upliftment of Muslims across India . Indian Muslims used to and are relying on the so called secular parties for the fulfillment of their needs and in return they get nothing from them and these parties treat them just as their vote bank only and use lip service and verbal jugglery to please them and did nothing substantial work for them on ground so far. The condition of Muslims is pathetic and as stated by Sachar Committee report that in various places of India the condition of Muslims is even worse than of Dalits ( considered to be of ‘low caste’ and untouchables by some Hindus). There representation as per the above report is almost negligible in all sectors and clearly lack representation, their share in govt employment is 4.9% against the population of 14% and in many states it is exactly zero. They are way behind in every sphere of life. Rather than relying on others Indian Muslims will have to take the burden of their grievances and problems themselves and address them on their own as rightly stated by Maulana Ajmal “we heavily depended on secular parties to work for our socio-economic and political empowerment. This is not possible we have to solve our problems on our own”. Another problem faced by the Indian Muslims are that they have been made scapegoats in the name of national security rather vilified as was seen recently when many youth almost all Muslims were arrested on ‘charges of involvement in bomb blasts’ from the remote and most backward district of Azamgarh in U.P. They are being selectively targeted for any wrong that happens in India . They are treated as second class citizens with no trust on them in their own country, among India ’s Security Agencies (namely, CRPF, CISF, BSF, SSB etc.) Muslim representation is 3.2 per cent only. Those who lynched, mauled and mutilated them by instigating anti-Muslim riots in which thousands of Muslims were butchered mercilessly find themselves in higher echelons of power rather than facing the law of land and escape any accountability with total impunity. The followers of Damodar Savarkar have gained much ground in ‘secular’ India by inducing fear among Muslims and inviting Hindutva doctrine. Ironically the so called secular parties of India have always played pawns in the nefarious game plans of saffron forces, they in real sense act as team ‘B’ of these Hindutva brigades in their every heinous act. Muslims of India look scattered at present with no direction and their future looks uncertain in this dark atmosphere amid this the decision of these Muslim leaders to form political party at national level to focus for upliftment of Muslims from the backwardness and removing the stigma attached with them is a welcome move and a right step in right direction. The savagery of Israel is before whole world, the naked dance of death and destruction, mutilated bodies, scenes of injured persons and the rubble of buildings scattered all over Gaza. Her blood thirsty belly consumed more than 1300 innocents without any mercy. Though the announcement of ‘ceasefire’ has come with it withdrawal of Israeli troops from Gaza but the peace in the region looks uncertain yet as borders of Palestine are under total siege by Israel. Israel once again showed her crude and arrogant face throwing every law and morality to winds with U.S at its back. Used white phosphorus bombs which burns quite fiercely and other unethical weapons on hapless people of Palestine. Bombarded U.N head quarter in Gaza at a time when U.N general secretary Ban-Ki-Moon was in the region for ‘peace initiatives’ Had this act been taken from other side the reaction obviously would have been different, whole world would have not only joined heads in the condemnation but for sanctions as well. Although India used some measured words in the condemnation of Israeli attacks on Palestine but still it has no moral ground to condemn it as it enjoys close relations and proximity with Israel. Both learn from each others suppressive tactics which they employ in their respective occupied parts. Recently chief of Israeli ground forces Maj. Gen. Avi Mizrahi visited Kashmir in helping Indian forces in their counter insurgency operations in Kashmir to crush the armed rebellion here. Both are alliance partners in perpetuating State terror and oppression on the people who demand their birth right of freedom and statehood. Meanwhile the heat and dust created by India in the aftermath of Mumbai attacks refuse to die down as India has threatened to snap its ties with Pakistan and according to reports India is keeping its ‘powder dry’ till SAARC foreign ministers meet at Colombo in what India says ‘to line world’s solidarity after Mumbai attacks at its doorstep and to build collective pressure on Islamabad to dismantle terror infrastructure’. While the hot pursuit adopted by Congress is understandable as it wants to reap on the charged atmosphere to its election benefit as elections are few months away exactly what BJP did after Kargil war but so called Indian peace activists have also toed the government line. The former U.N under secretary general Shashi Tharoor in his article in times of India titled “Keep up the pressure” says “The threat of sanctions (by UN) would be even more potent if they specifically targeted the Pakistani military, including travel bans and other military assistance…Pakistan must not be allowed to believe that with the passage of time, Mumbai will have been forgotten and Islamabad will be off the hook”. Sensing the loosing of ground to Congress the BJP has upped the ante by raising the issue of Afzal Guroo once again to checkmate the congress. Many insiders of Congress believe that by hanging the Afzal Guroo congress will atleast finish one issue with BJP, without visualizing the repercussions and consequences it will have in valley and on the newly coalition of NC-Congress. India finds itself in the whirlpool of duplicity and double standards and this was echoed by former Home Minister Shivraj Patil as well while speaking to the media men he had said “people are saying don’t hang an Indian in Pakistan, Sarbijit, and then are demanding hanging of Afzal Guroo”. Remember how A.R.Antulay had to resign, simply for demanding investigation in the killing of ATS Mhahrasthra Chief in the wake of Mumbai attacks, which smells something fishy in the Indian camp. Though due to Mumbai attacks the fragile peace process has received a jolt mainly due to jingoism and belligerence of India and the over reaction showed by India over the David Miliband’s statements shows her denial mood and rigidity but and core dispute of Kashmir can’t be put on back burner forever as its nature wouldn’t allow her to do so. This main dispute of Kashmir if kept lingering will escalate the tension in the region so it is better for India’s own Security and progress to shun obduracy and intransigence and come to negation table without closed chest. Both countries (India and Pakistan) being Nuclear armed can’t afford war therefore best for them and for entire south Asia would be the restoration of national sovereignty to the Kashmir which will usher an era of long-lasting peace, security and progress of entire South Asia. Kashmir is a lingering international dispute, basically a simple political issue involving the future of people of Kashmir who have to decide its course through a promised plebiscite but the chauvinism of the Indian rulers rendered this dispute complicated and confounded. Kashmir which is having 5000 year old history lost its sovereignty at the hands of Mughals on 1585 A.D. There after Mughals came Afghans then Sikhs then Dogras and then afterwards claiming it self as world’s largest democracy laid her hands on this through fraud, foul play, treachery and using military interference. The real trouble began when on June 4, 1947 Lord Mountbatten brought plan for partition of India called Indian Partition act 1947. According to this act area comprising of Muslim majority will constitute a new country Pakistan and rest areas having non-Muslim majority will remain as India. But this act was applicable only for British India not for princely states which were near about 564 and were under indirect control of British. These 564 states were given choice either to choose to remain Independent or join any one of the two dominions in keeping two things under consideration first, majority of subjects whether Muslim or non-Muslim and second continuity of their states borders. As for as Kashmir is concerned it was a princely state and was having 85% Muslims and its border has continuity more with Pakistan than with India so there were only two options before Maharaja of Kashmir either he should have declared Independence or announced to accession with Pakistan. The laws relating to partition were never honored sincerely. India used its force and captured Hyderabad and later invaded Junagarh on pretext of being Hindu majority area and violated same by invading Kashmir. The state of Kapurthala had Muslim majority but non-Muslim ruler which through help of RSS succeeded in eliminating his Muslim subjects and same was repeated in Alwar and Bharat Pur. These tactics were also used in Jammu province were 5 lakh Muslims were butchered and lakhs were forced to flee mostly during November 4th, 5th, and 6th to turn it in to Muslim minority area. There after this dispute went to U.N which passed resolutions declaring it a disputed territory whose future is to be decided by its people through a referendum to which both India and Pakistan agreed. The beauty of Kashmir and its picturesque and breath taking serenity always lured many Mughals, Afghans and Sikh governors to think of declaring themselves as independent of their masters. Akbars subedar Mirza Yadgar, Raja Sulkhjiwan and Amar Khan two protégés of Ahmad shah Abdali, Sheikh Gh. Muhammad governor under the Sikhs toyed the idea of Independent Kashmir. Even Maharaja Hari Singh personally desired of Independent Kashmir. Chaudhary hamidullah Khan (then acting president of Muslim Conference) also urged Maharaja to declare Independence and assured him cooperation in this regard. In May 1953 Adali Stevenson met Sheikh Abdullah in Srinagar and on the same year on 13th July during martyr’s day speech he said “the Kashmir position was such that it should have the sympathy of both India and Pakistan- it is not necessary that our state should become an appendage of either India or Pakistan”. After the failure of operation Gibraltar and Indo-Pak war of 1965, many Kashmiri stalwarts like K.H.Khursheed and Shaheed Maqbool Bhat started to think of Independent option in practical terms. Moreover India and Pakistani leaders have time and again made commitments to Kashmiris regarding their Independence. Recently former Finance Minister Tariq Qarra had laid proposal of Kashmir having its own currency which it was enjoying before 1947 but due to unknown reasons it was shelved under the carpet. May be due to the reasons that it didn’t suited those who matter at the higher echelons of power as Kashmir having its own currency has potential and impression of being a sovereign state. Though due to recent Mumbai attacks the fragile peace process has received a jolt mainly due to jingoism and belligerence of India but the main cause and core dispute of Kashmir can’t be put on back burner forever as its nature wouldn’t allow both countries to do so. So it is better for India’s own Security and progress to shun obduracy and intransigence and come to negation table without closed chest. Both of them (India, Pakistan) are nuclear states so can’t afford war therefore best for them and for entire south Asia would be the restoration of national sovereignty to the people of Kashmir. On 26th January 1950 India became a sovereign democratic Republic with a written constitution and elected parliament. The Indian Constitution, the longest in the world, consist 397 articles and 12 schedules which provides for a single citizenship for the whole of India. Really something to cherish and enjoy for Indians and reason for them to make celebrations to mark this day as national pride and honour. But the coin has other side as well, as India marks its Republic or Independence day with whole of its population expressing joy Kashmiris prefer other way by marking this day as black day by a general strike and processions at various places to show the resentment brewing in their hearts and minds. It is not out of hatred but due to Indian leaders who despite their clarion commitment regarding a referendum in Kashmir for its final dispensation blatantly reneged on their promise and pledges. Does it suit you as a country who claims itself to be ‘world’s largest democracy’ to hold a region against its populace’s wishes and aspirations and deny them the basic democratic and internationally recognized right of self determination which you promised to them before whole world. Your betrayal and perfidy has cost your honour as a great nation. And how can you stake a claim to the permanent membership of UN Security Council when you put your damn foot on the resolution passed by this world body to which you and Pakistan are signatories and shamelessly declare Kashmir, an internationally recognized territory, as your integral part and get irritated by some rational comments by world leaders who foresee its inherent potential to destabilize peace of whole South Asia. There is no flag large enough to cover the shame of killings of innocent people.